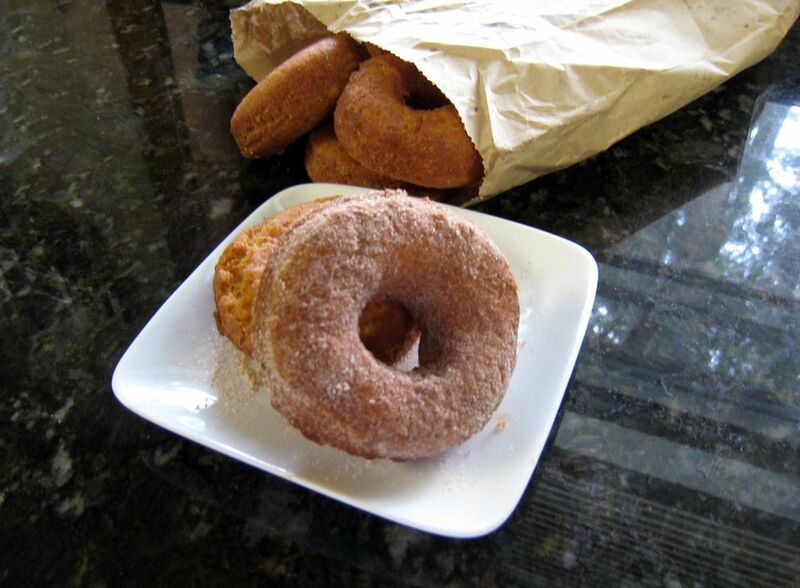 These old-fashioned doughnuts are made with nutmeg and a dash of cinnamon. Roll the warm doughnuts in sugar or leave them plain. See the honey-dipped options in the tips and variations. These doughnuts will take you back to your childhood. Serve them warm or at room temperature. In a bowl, combine the shortening, sugar, and egg yolks. Into another bowl, sift together flour, baking powder, salt, and spices. Stir into the first mixture alternately with 1 cup milk. Stir until dry ingredients are moistened, handling the dough as little as possible. Roll dough to about 3/8-inch thickness on a floured cloth-covered surface. Let the dough stand for about 15 minutes. Meanwhile, in a heavy, deep saucepan, heat about 2 to 3 inches of cooking oil to 370 F. Fat is ready when a doughnut center browns in about 1 minute. Avoid crowding the pan and keep the temperature as steady as possible. Cut doughnuts out with floured 2 1/2 or 3-inch doughnut cutter. Fry doughnuts in the hot fat, turning carefully with a wooden spoon handle when the first crack appears. Continue cooking and turning until browned nicely. This will take about 1 1/2 minutes total frying time. Drain the doughnuts on a paper towel-lined plate or pan. Deep-fried doughnuts are an indulgence, but you might avoid them if you are following a diet. Consider baked doughnuts, such as these glazed eggnog doughnuts, cranberry doughnuts, or red velvet doughnuts. Or you might like these fried apple cider doughnuts. Honey Dipped Doughnuts With Coconut - In a saucepan over medium heat, bring 1 cup of honey just to the boiling point. After the doughnuts have drained, dip the tops in the hot honey, turning to coat. Let the excess drip off and then dip them in coconut. Place them on racks over foil or wax paper to dry. You Can't Go Wrong With This No-Crust Custard Pie!